OfficeWatch XT is a powerful telemanagement application designed specifically for enterprise to simplify the management of the communication system and increase voice network visibility. The multi-site, multi-country, multi-PBX, multi-currency call tracking system centralizes reporting among the call network streams into a single database to provide enterprise-wide reporting capabilities. 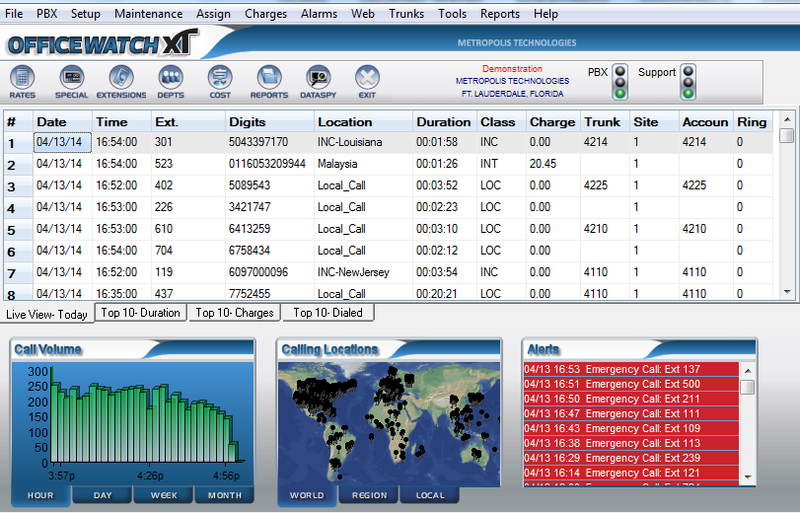 OfficeWatch XT is a highly flexible and powerful tool with a sophisticated platform that is capable of handling the high-capacity call volume produced by enterprise organizations. Designed for ease of use, XT includes a simple navigation menu and an intuitive dashboard to make configuration and even advanced functions accessible with the click of a button. Beginning with 1000 extension configurations, XT includes up to three sites to centralize reporting from varied data streams, and is scalable to increase extensions or sites as needed.